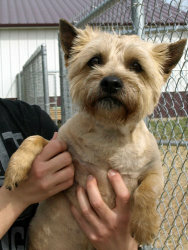 Let me start off by saying that last week's featured dog, Punkin, got adopted! Another adoption success! Today I'm going to be bringing you one of Enid's own. In fact this little doll is from the same shelter we got our baby Remington, the Enid S.P.CA. Dee Dee was born on 1-1-04 and is a little over 7 years old. 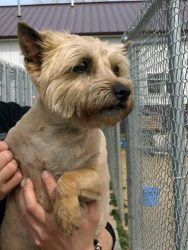 She is a cairn terrier and weighs about 20 pounds. She is spayed and up-to-date on all shots. And since she's a mature girl, you won't have to worry about her chewing up any furniture or shoes like puppies do. Although the are sadly often overlooked, there are plenty of benefits to adopting an older dog. All Dee Dee wants is a good family to call her own. Go in and see her today! For more information on Dee Dee, go here. Contact Enid S.P.C.A. at enidspca@suddenlinkmail.com if you are interested. Or call 580-233-1325. Even if you're unable adopt Dee Dee yourself, please share this post on Facebook to spread the word! Adopting a dog is a lifetime commitment. We would love to bring you on board. Start posting about a dog in need of a home on your blog or facebook page today! oh and join the Woof Wednesdays group on facebook!